I am a 16-year PMC rider. 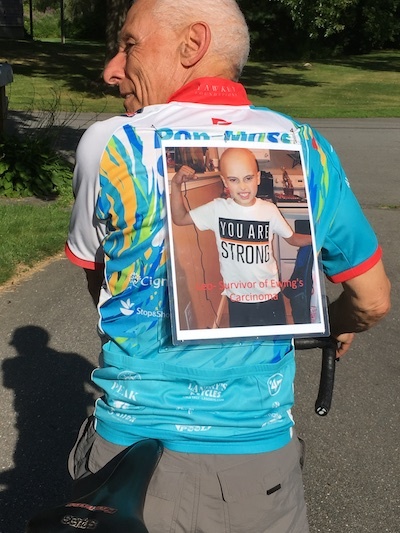 This year I was given the special opporunity to ride for a courageous young boy and his family to raise awareness of the struggle they are engaged in to overcome Ewing’s Sarcoma. Ewing’s Sarcoma is a rare form of (primarily bone) cancer that generally attacks young boys. Leo was diagnosed about 9 months ago with a cyst in his leg that resulted in an amputation of his lower leg and is now in a continuing course of chemotherapy. Fortunately, I can say that the treatment Leo has received has resulted in his being cancer free at his last checkup. I wore a picture of Leo on the back of my PMC jersey this past weekend and that triggered a response from a woman who was aware of Ewing’s Sarcoma that afflicted a 27-year-old male in his shoulder. Those who are involved in the fight against cancer were also aware, but admit that the funding for research into rare cancers is limited. The hope for Leo’s family is that more awareness will spur investment to understand the causes and treatment options that will benefit Leo and the others who have this disease. On behalf of Leo and his family, I thank you.